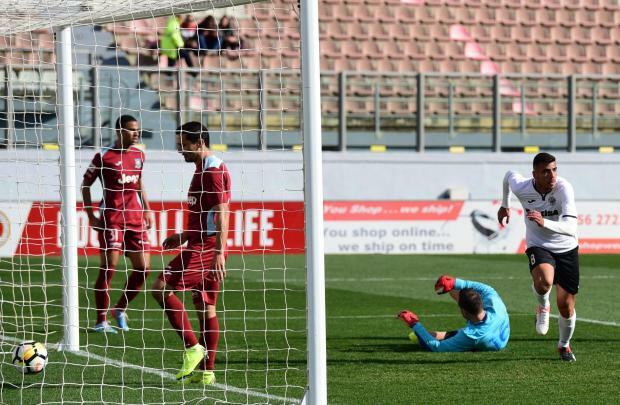 A solitary goal by Jake Grech has put Hibernians back at the top of the Premier League and send Gżira United crashing to a first defeat ending their 16-game unbeaten league run. The Paolites were brimming with confidence on Sunday, with Bjorn Kristensen threading through balls for the likes of Jake Grech to run into promising positions. Hibs created enough chances in the first half to open better cushion than a mere one-goal advantage. In particular, Taylon looked out of sorts as the Brazilian wasted a string of changes to put the Paolites out of sight. Grech scored the all important goal after 36 minutes when he swept down the centre and connected with the winger’s cross before directing the ball behind Haber. Tempers boiled over in the closing minutes when Fernando Barbosa tangled with Marco Sahanek to leave referee Alan Mario Sant no other option but to send him off. Remarkably, Gżira now pounding forward with more agression and at death Rodolfo Soares saw his goalbound chip brilliantly hooked away by Marko Jovicic. Jake Grech of Hibernians was named BOV Player of the match.